To say that the astronomical success of Black Panther was unexpected, is so much of an understatement that it's almost insulting, not only to the movie itself, but to the notion of what anything "unexpected" truly may be. Despite a rich history, dating back to 1966 when he became the first superhero of African descent in mainstream comics, T'challa (Chadwick Boseman) was rarely seen as a major character. Fittingly, Black Panther's arc from relative obscurity to blockbuster sensation on the big screen is quite similar to how Tony Stark and his Iron Man persona was seen by comics fans, before Robert Downey Jr. brought that character to life in 2008 for the first time, giving birth to the Marvel Cinematic Universe as we know it. Now that Black Panther is a bona fide sensation, we're breaking down why it's astronomical success is such a monumental feat. Before we break down the numbers, we must first actually present the numbers. As of now, Black Panther has earned $612.1 million at the domestic box office, along with $590.4 million in international markets, for a worldwide tally of $1.202 billion. It currently stands as the seventh highest-grossing movie at the domestic box office, and could very well pass Star Wars: The Last Jedi ($619.8 million) for sixth place and The Avengers ($623.3 million) for fifth place in a matter of days. When it passes The Avengers, it will not only become the highest-grossing MCU movie at the domestic box office, but also the highest-grossing domestic superhero movie, period. All of these numbers are impressive... but when you take into consideration a number of other factors, including the fact that it put up these numbers in February and March, instead of the more lucrative summer months, it's clear that Black Panther is quite special, in more ways than one. Black Panther has also set a number of unconventional records that have made headlines of late, like last weekend, when it became the first movie since Avatar in late 2009 and early 2010, to win five straight weekends in a row at the box office. Avatar actually won seven straight weekends before being dethroned in frame #8 by Dear, John, of all movies, but that's neither here nor there. Black Panther has also been a juggernaut on social media as well, with Twitter announcing this week that Black Panther has amassed a whopping 35 million tweets, surpassing Star Wars: The Force Awakens and Star Wars: The Last Jedi to become the most tweeted-about movie of all time. Regardless of whether or not Black Panther will climb any higher than expected on the all-time charts, its run has been one for the ages, and one that is quite worthy of a deeper dissection. 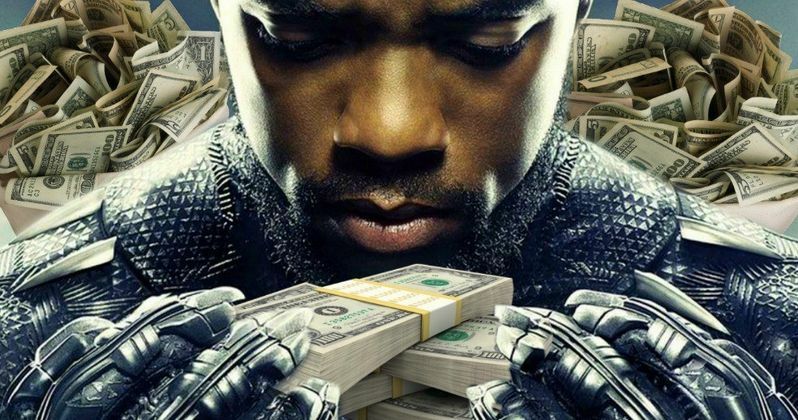 With that in mind, we have broken down 10 different aspects of Black Panther's box office run, delving deep through the charts to break down why this is an important movie that studios should be examining now, and for years to come, in terms of everything from socio-political issues like inclusion and diversity, to the numerous box office myths this movie was able to dispel. With that in mind, take a look at our 10 reasons why Black Panther's box office success is so important. Black Panther doubled its initial projection. Usually anywhere between four and six weeks before any given movie opens, box office analysts dole out their early projections, which are often adjusted up, or sometimes down, depending on the buzz a particular movie is getting from critics, early fan screenings and other factors. Before Deadpool opened in practically the same mid-February frame Black Panther did, analysts projected a $50 million opening for the R-rated superhero movie, which some even considered generous. It ended up earning $132.4 million, an all-time record for an R-rated movie, so these projections are anything but an exact science. In late January, the first projections came in for Black Panther, putting its opening weekend between $100 million and $120 million. It ended up opening at $202 million ($242.1 million with the four-day President's Day holiday), the highest debut ever for the month of February, and the fifth highest opening in history. Blockbusters aren't exclusively summer movies anymore. For decades, the studios have been targeting the summer months for all of their blockbuster "tentpole" fare, for sound and obvious reasons. The most important of these reasons are that all of the kids between 13 and 17 are on summer vacation and can frequent their local theater with more freedom than they could on say a school night with homework. Even with the last three Star Wars movies opening to huge numbers in mid-December, the kids are on break then too. Still, in more recent years, movies like The Hunger Games ($152.5 million debut in mid-March 2012) and even R-rated fare like Fifty Shades of Grey ($166.1 million debut in early February 2015) and Deadpool ($132.4 million debut in mid-February 2016) have proved that the right movie, targeting the right audience, can still put up summer-like numbers. Even with all that being said, Black Panther went above and beyond, putting up the only debut over $200 million for a movie that didn't debut in the summer or over the December holiday season. It Came close to breaking The Force Awakens' Sunday record. While that doesn't sound super-impressive on its own, a day-to-day breakdown of the Black Panther opening weekend reveals some incredible consistency. The record for the highest daily gross for any Sunday in history, unsurprisingly, belongs to Star Wars: The Force Awakens, which took in $60.5 million on the Sunday during its opening weekend. The Force Awakens also holds the daily record for Friday ($119.1 million), but it has the third highest Saturday gross ($68.2 million), just behind The Avengers ($69.5 million) and Jurassic World ($69.9 million). The Force Awakens dropped 42.7% between Friday and Saturday, and another 11.3% between Saturday and Sunday. Black Panther didn't have nearly as impressive a first day ($75.9 million) as The Force Awakens, but it only dropped 13.1% on Saturday ($65.9 million) and just 9% on Sunday ($60.06 million), to come oh so close to the Sunday record.